This week I flew back home to Rome for the weekend to walk around the centre and absorb all of the sunlight. 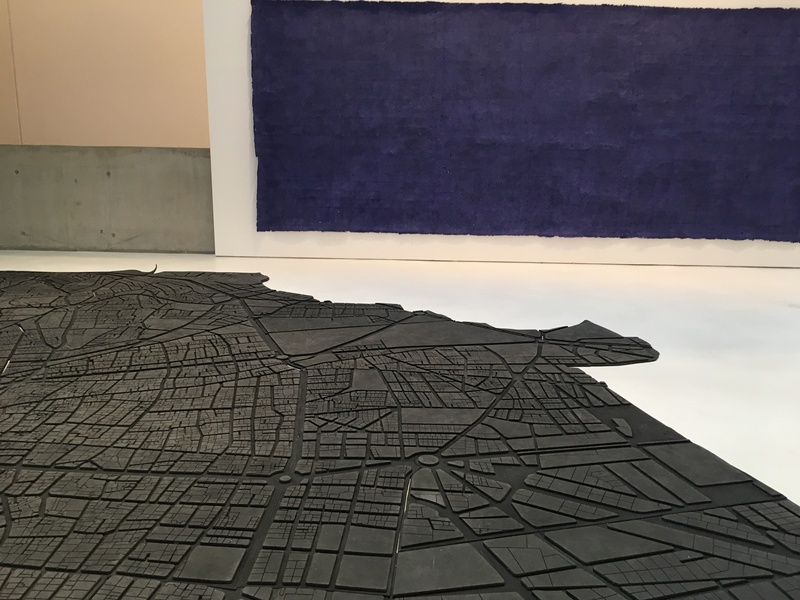 The city is currently hosting a series of big-ticket exhibitions, such as Turner at Chiostro del Bramante and Monet at the Vittoriano, but I decided to spend my two days in the company of contemporary artists and made my way to Gagosian and MAXXI. Gagosian Rome, architecturally speaking, is perhaps my favourite of Larry’s outposts. Placed at the ground and first floor of a classic Roman palace, the space opens up to reveal curved walls, reminiscent of Bernini’s baroque architecture – whose curves were designed to embrace visitors. 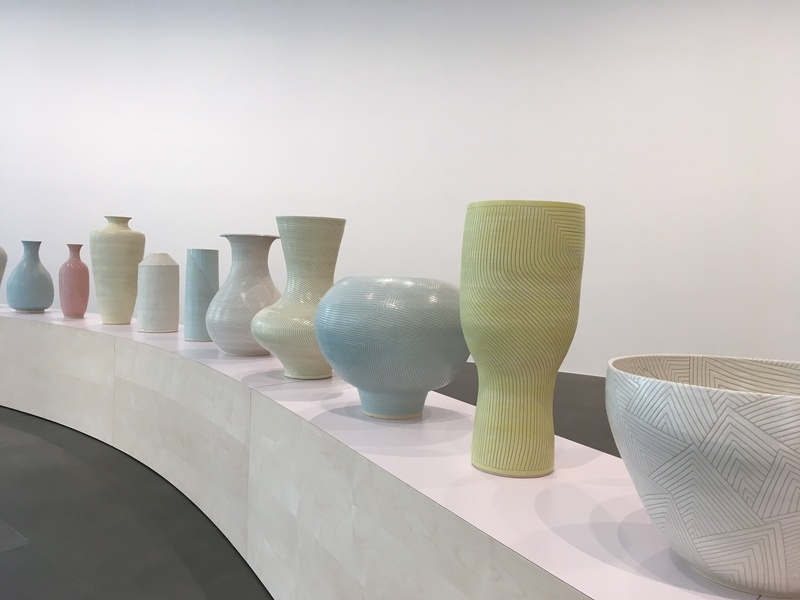 This feature, coupled with the incredible amount of natural light that seeps through makes it a wonderfully quiet and delicate gallery – one in which Shio Kusaka’s new ceramic works feel at home. Kusaka works often combine elements of figurative representation with more abstract features, yet in her new solo show – her first in Italy – she opted to present ceramics which purely geometric, and thus abstract, patterns. 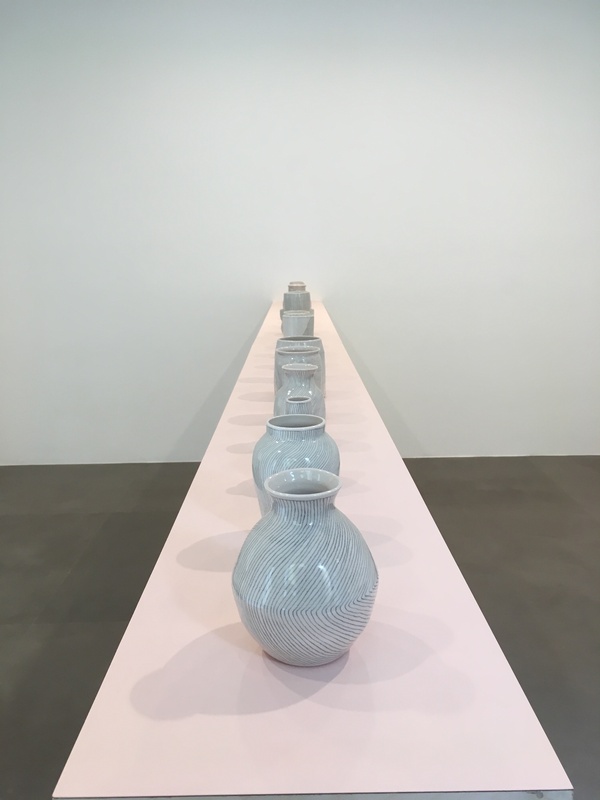 These line, or rather guides, that run through the different vases recall Bridget Riley’s works, or Rosemarie Trockel’s grid-patterns. By hand drawing each of the lines, Kusaka retains a tactile quality about them, more akin to drawing than sculpture. The understated soft, pastel hues – pink, yellow and green – chosen to envelop the works emerge beautifully when placed on the curvature in the middle of the gallery, enhanced by the natural warm light and the white backdrop that surrounds them – appearing to visitors as if floating. However, the vases I spent time sketching were the smaller ones in the first room. Smaller in scale, these white pots also display the same geometric patterns, yet this time akin to pencil drawings. 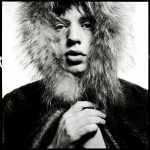 In their minimalist simplicity they feel more immediate, more personal and intimate than the larger works. 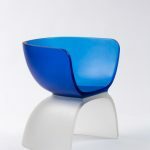 Kusako’s choice of material adds to this, as they are made of porcelain – we are immediately drawn to their fragility, becoming protective of them. 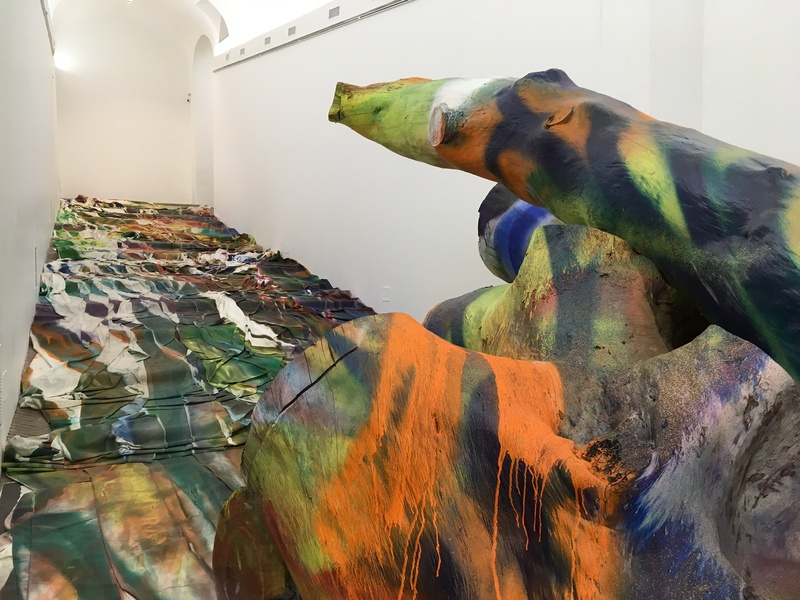 From via Francesco Crispi I turned left and walked up towards Villa Medici, home to Katharina Grosse and Tatiana Trouvé’s new show – Le numerose irregolarità (numerous irregularities). The two artists, whose practice appears to diverge, have created works intended to converse with and complement each other. Grosse’s typical digital silks on screen are placed in the same room as Trouvé’s bronzes. 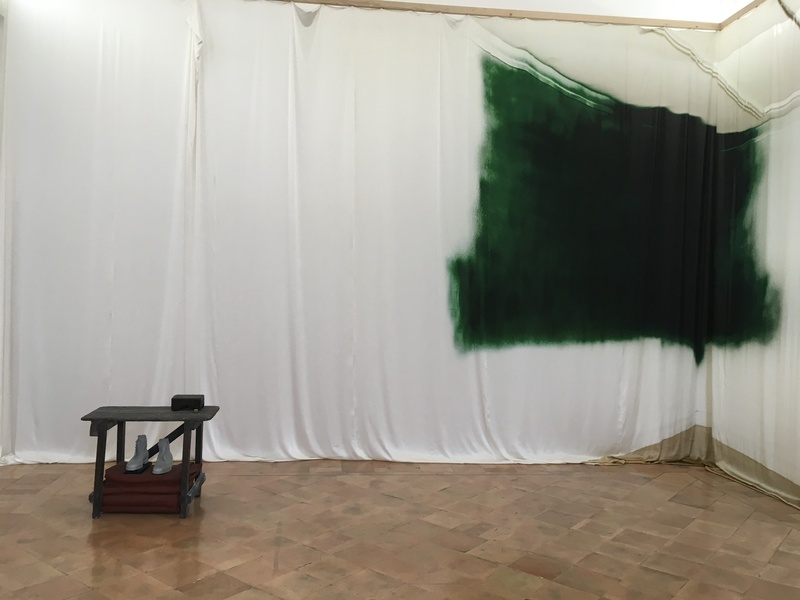 We open with this exact confrontation, as Grosse’s green corner – her first in situ painting made at the Kunsthalle Bern – comes into contact with Somewhere in the Solar System and The Great Atlas of Disorientation. In the latter two we see Trouvé’s incredible ability to deceive us into thinking the different elements comprising, for instance, the atlas, are made out of discarded carton. These constructions appear ephemeral – a gust of wind could blow them away – and Grosse’s silk draping adds to this, creating what appears to be an unmade room. As we venture further we find Grosse’s Ingres Wood. As she was not able to intervene directly in the gardens of Villa Medici, Grosse used trunks from felled trees planted by Ingres in the garden. She uses bold colours to give these a new coating, placing them at the bottom – in a tank-like formation – their bodies pointing towards the chaotically chromatic draping which covers the entirety of the staircase. 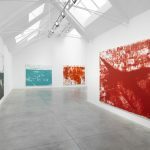 As we reach the top I could not help but notice the abrupt change from what in my mind was a loud room – as I sensed each of the colours screaming in their own voice – to a delicate, poetic gallery in which Trouvé’s Wander Lines was waiting for us. Here Trouvé creates branch like bronze structures, barren trees, on which tiny pink tags are hung – each offering a different line, or thought. 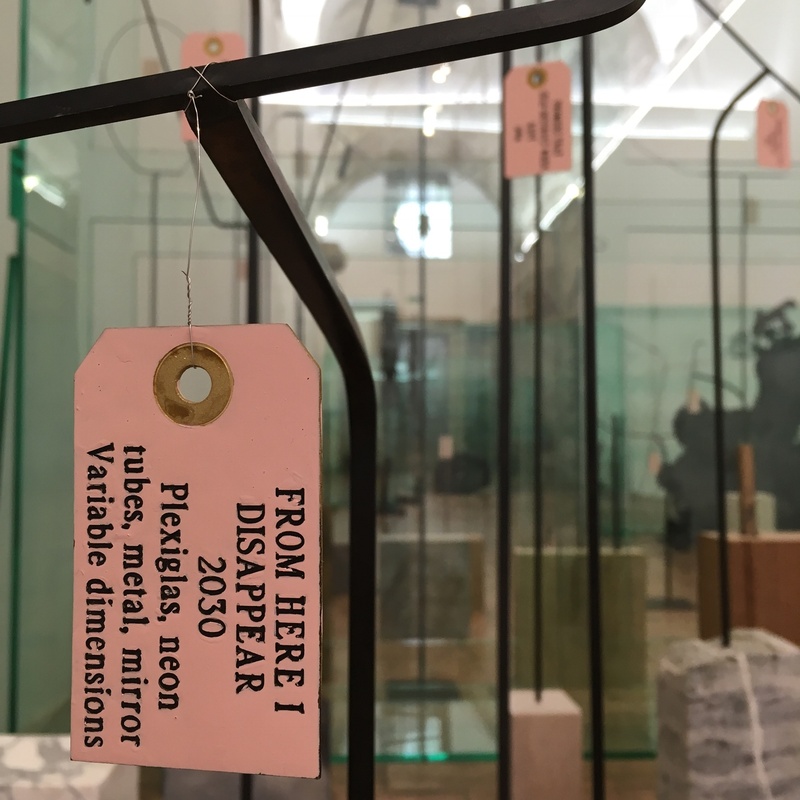 The tags in particular echo Alice in Wonderland and as we navigate through the final gallery we see Trouvé as a story teller, narrating through her cast bronze objects and plexiglas structures. My final stop, prior to the airport, was Zaha Hadid’s MAXXI. The futuristic building is home to an incredible permanent collection, with a Sol LeWitt, Zorio, Calzolari and Lawrence Wiener all of which I could write about for ages. I was there to see Home Beirut – Sounding the Neighbours, namely the new chapter in the series Interactions across the Mediterranean, which had previously focused on Iran and Istanbul’s and now turned its eyes to Beirut. With over 100 works by 36 different artists, the show was an incredible survey of contemporary art in the Lebanese capital. It also allowed visitors to experience, or at least understand, the intricacies and complex layers of the city. The exhibition has been divided into four sections – home for memory, home for everyone, home for remapping and home for joy. I have been obsessed with Etel Adnan ever since her show at the Serpentine Gallery so seeing her works, and in particular her Leporello pieces – was an incredible start to the show. 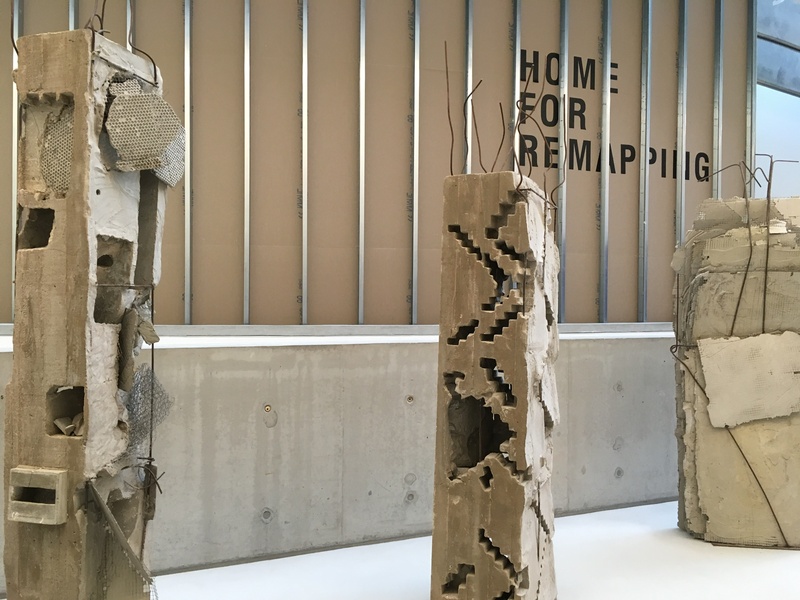 I then moved through Marwan Rechmaoui’s Pillar: Duchamp’s Bride – seven cement pillars whose pastiche-like features recall Frankenstein’s monster, and speak to the city’s bombardments and resilience. Video installations are heavily featured – amongst these we find Roy Dib’s A Spectacle of Privacy, in which a provocative solution to the Israeli-Palestinian conflict is offered as a couple draws parallels between that and their sexual relation. We find Akram Zaatari’s Beirut Exploded Views and see young men in half constructed homes, suspended in time, looking up at the fireworks and then experiencing a shift in perspective as aerial shots of Beirut are shown – capturing its beauty and incongruity. One of the works I enjoyed most was Mounira al Solh’s Rawane’s Song. She films herself walking around, her thoughts appearing on the screen, discussing unfinished projects. In particular, she had decided to make a mixtape after asking several Lebanese women for their favourite songs. Her tone is witty, as she recounts that none of the women chose songs whose lyrics discussed the war, but rather preferred typical pop love songs, in her words “they weren’t even that romantic”. Moving across the different rooms we are also invited to see how the city’s architecture has changed in recent years, with models of upcoming projects for museums and social housing. 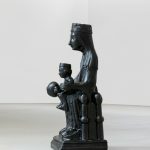 This entry was posted in ART, Art Reviews., EXHIBITIONS, My week in the art world and tagged Akram Zaatari, Etel Adnan, Gagosian, Katharina Grosse, Marwan Rechmaoui, maxxi, maxxi rome, Mounira al Solh, roy dib, shio kusaka, Tatiana Trouvé, villa medici. Bookmark the permalink.